The Montana was inspired by strong and majestic mountains. These 12mm thick tempered glass vessel sinks are designed for above counter use, creating a centerpiece in any bathroom without sacrificing durability. Available in transparent charcoal or transparent black. JSG Oceana's Pebble glass Undermount/Drop-in Combination Sink allows the customer to decide which installtion best fits their needs. This model is available in our most popular five colorations and a new pattern at a popular price! With an option to install as either an Undermount or Drop-In, the Pebble sink becomes a focus for light and reflection. In master bath or small bathroom, these beautiful creations add a touch of elegance to any space. Resistant to scratches, stains, chemicals, and thermal shocks, JSG Oceana glass sinks are both durable and memorable. 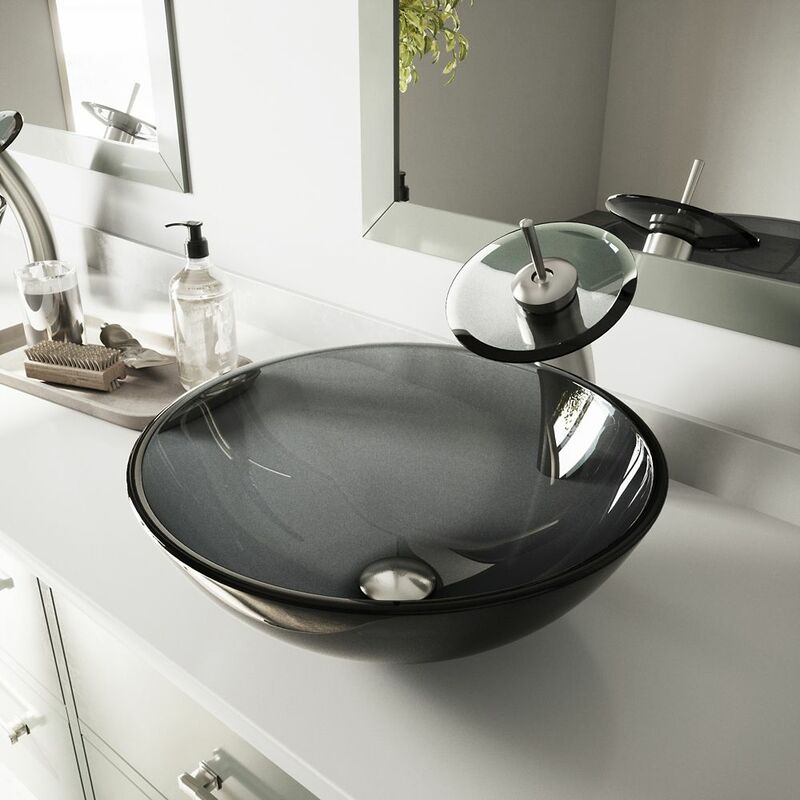 Glass Vessel Sink in Sheer Black with Waterfall Faucet in Brushed Nickel is rated 4.7 out of 5 by 50. Rated 5 out of 5 by A88 from Love the vessel and faucet. Easy install.... Love the vessel and faucet. Easy install.